Yes, our 14month old is sitting in a Bumpo! To start, I'm very aware that Ben is too big and too old for a Bumpo. He found it in the old baby stuff a couple weeks ago and is obsessed with it! His little, chubby thighs barely fit in and out of that thing. My plans this weekend include getting Ben a more age appropriate chair! Anyway, he's getting pretty good at these songs! If You're Happy and You Know It is a pretty new one for us, but I think he's doing quite well, especially with how close to bedtime it was when I took this! He's also getting very good at Ring Around the Rosy, Itsy, Bitsy Spider, and is a MASTER at Patty Cake! We're winding down from a very busy week. To follow up on my cliffhanger from last week since Brian clearly has no time to blog. Brian got a new job and started last week! We're pretty excited! During the transition time I went to full time for a few weeks so this week we were both working a lot. I'm going to be cutting back now that Brian is getting settled in. Ben's been loving going to his babysitter's though! Her son Jimmie, who's in the 7th grade is trying to teach Ben how to fist pump which is adorable. Ben just lights up when he sees Jimmie! Back to Brian's new job. I will let him describe it as I am not exactly sure what he does yet. He knows! He's still at University of Chicago, but at a different job there. No longer a post doc! Whew! We're also gearing up to have Grandma Karen the Magnificent and Grandpa here next weekend! Hope they're bringing their boots and shovels. Actually, the weather guy says we may be warming up over the next week to the 30s or so! Pretty balmy actually. Hope everyone is doing well. Stay safe and warm! As promised, I checked with my tech support (Brian) and it's not us, it's Google. There is a system wide problem with videos on blogger. So, be patient and keep trying, they should all work soon. And remember, even if it's a black screen, click on the play button and it should work. And I hope this one does! I wanted to capture the extreme panic in Ben whenever Abby goes outside. Sometimes he just stands there quietly, other times he screams like this until she comes back. His other routine has become getting her a treat. He is sneaky, he will try to get her more than the one he is allowed. Now, I realize I look like a softy in the video as he reaches in a second time, but the video was going so well that I didn't want to totally ruin it! Abby is continuing to learn that Ben is an ally more and more. Ben is learning how to sneak Abby food from his chair whenever Mommy turns away. It's cute but irritating. Also, he's yelling for Abby. It's one his pretty understandable words. It sort of sounds like "AAAA EEEEEE." But we get it. Ben also got a new pair of sunglasses from his baby sitter! He's never had a pair before! He actually is starting to keep them on for more than 15seconds at a time. I'm trying to get him used to it in hopes that we will someday see the sun again. We have started a new day care which a lady who runs one out of her house. Her name is Mary. She is VERY nice! We started going to her a little while back. She has five children of her own in various stages of leaving the nest. The couple kids she has left in the house LOVE Ben, of course! She watches a couple other kids throughout the week. Mary has bragged and bragged on Ben. She reports to me how amazed she is at his speech abilities, and how smart he is. He continues his addiction to books and that has carried over to daycare. He is apparently carrying various books to other kids in hopes they may be able to read it to him. He is just our little scholar! Eating habits: I've realized maybe he isn't as picky as I once thought. He LOVES tofu (Aunt Allison is so proud), and we realized the other night anything Turkey, especially turkey burgers (sorry Aunt Allison). Eggs are a Ben pleaser. He's starting to open up a bit. Teeth: I think some are continuing to try to come through. He's a bit sensitive these days and drooling a lot more. So, either we've taken a step back on the drooling, or he's getting more teeth. We've help steady at 8 for months now! Nothing else really to report here. I'm going to encourage Brian to blog this weekend on a little something new in his life. A recent change that we're really excited about. I want to leave you with a little cliffhanger! I don't know what's happening with our videos these days. I'll have to check with my tech support, also known as Brian. That's his area. Hopefully these work. They're a bit grainy but you can still see how cute he is. Also, they look black, but just click play and they should still work. Ben has enjoyed dancing, twirling, and kissing lately. His kisses can be cute, but when he gets into it, it can be quite disgusting unless you're his Mom! We're trying to encourage blowing kisses and then keeping his lips closed while kissing! Things here are going very well. Our house is warm and cozy with our new working furnace! We're enjoying some Olympics and Duke basketball this weekend. Ben is amazing! That boy is BUSY! He's into everything. He cannot be trusted for minute. He is getting bigger and stronger which bodes well for his climbing onto EVERYTHING! He pulls himself onto the couch, chairs, you name it. He's not very graceful getting down therefore my life is spent making sure he doesn't break his neck. He's also just a quarter inch away from reaching the doorknobs. He knows that you are to spin the knob to open the door, but can't quite reach around it. I'll have to try those handle covers because I like just closing the bedroom and bathroom doors to keep him out of there. We had to take a trip to the Sprint Store this morning. I think we found Ben's definition of Heaven! He continues to be obsessed with phones or anything that slightly resembles them. We walked into that store, and it was over. He was ALL OVER THE PLACE! Sleeping habit update: Doing well (knock on wood). We decided to hold off on the whole transition to one nap. This boy just functions better with a morning and afternoon nap. There continue to be pros and cons of this. The biggest con still being if we have to run errands between his naps and mealtimes, there's not a whole lot of wiggle room. He is handling himself well if he misses one. He's a little more sensitive but then generally does go to bed a bit earlier. Bed time continues to be between 7:30 and 8pm. And he sleeps pretty well until 6:30am-ish, so we can't really complain. Eating habits: Picky. We started a new multi vitamin because this boy is just picky. We continue to keep pushing new things in front of him, but he just turns his head and screams. Then generally throws the food to Abby who anxiously awaits his scraps. Play habits: Everything continues to be monkeys. He just loves monkeys! He's starting to watch some cartoons. He'll pay attention for a minute or two, and if there are monkeys on then a good 5 minutes, maybe! 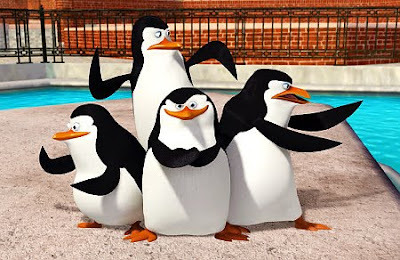 Penguins of Madagascar is an overall household favorite. I find myself enjoying those guys! Other play habits include throwing things and hitting things with a bat. Oh the joys of having a one year old boy. I think his real baseball bat is going to have to be put up for while. He's strong enough to swing that thing, and trust me, it hurts! He can't quite control it. Brian is fighting me on this quite a bit. He thinks we need to keep a bat in this kids hands at all times for him to have a shot at the majors. I think Brian also hopes the bat will go through the tv as he continues to push for new flat screen (no honey, there's nothing wrong with the one we have!). Reading is becoming a longer process. It's one of our favorite times of day. It's the only time he'll sit still and let me cuddle him. Before bed every night, we spend quite a bit of time reading a book to him, then he'll go get another one, we'll read it, then another, and so on, until he falls asleep. He is starting to prefer 3 or 4 of the books (they include monkeys generally). This makes the process a little less interesting for me and Brian. Where we used to read like 20 different books, now we're reading the same ones over and over and over again! I don't even look at the pages anymore, I have them memorized. Teeth: continues to hold steady at 8. He got those so young I thought we'd have more by now, but we're stable at 8. That's about it for now. We hope our family is staying warm! Some crazy winter weather going on out there. To think, our southern family thought we were crazy for moving to Chicago! Who's laughing now! We'll answer any questions and post some fun facts that you guys want to hear about! Keep the letters coming! Sounds easy enough, doesn't it?! Staying warm, that is. Just punch the button on the box on your wall and your house magically warms to that degree. That was all we had to do until last night. It was then that our house kept getting colder and colder. No matter how high we punched that little button. The furnace took it's last breath last night. So, we hunkered in. One space heater and lots of blankets. We are aware of the fire hazard, so we're keeping it high up. It's that or it's 20 degrees in here, though. With some quick research this morning and a couple of quotes, we are now getting our brand new furnace installed and will be warming up soon. The old one was just too old to fix. Anyway, while we're trying to stay in the one warm room of the house I thought I'd type a quick update. Ben is getting funnier and funnier! Sorry that both videos are with him in the high chair. He still gets so distracted with the camera that if he is mobile he just wants to get to the camera. So, it's best to get him to do some of his "tricks" while confined to a chair. He is really good at waving his arms like a monkey and clapping his hands like a seal (just as his favorite book says). He also thumps his chest like a gorilla. So cute! The other video is trying to capture Ben doing his "Ahhhhh" he now does after just about every bite and drink he takes. It's like he's saying "Ahhhh, that is so refreshing!" The video is also capturing his first attempt at feeding himself jello. A little sticky at the end but overall went well. He continues to RUN everywhere he goes. The faster he runs, the more we now know he is heading for something he shouldn't be. The kid is catching on quickly. More and more cabinet locks are going up, doors are being pulled shut (luckily, he's still too short to reach our door handles although he's trying everywhere). Other stats include: sleeping well (knock on wood), continues to be a more and more finicky eater, and continues to hold steady at eight teeth. To tackle one subject, eating. He's just sort of picky! Anything cheese, bread, or grapes he'll eat. He used to eat anything fruit, but even that is getting hard. He'll each a piece of banana or two, then done. Vegetables=forget it. Sometimes I can get him to eat cooked carrots, but just a couple. We continue to try to push new food in front of him everyday, and just keep doing it. I'm thinking he's just too busy to eat these days. He just wants to get down and play! Not much else to report. I hear the guys down there drilling away with our new furnace. Until it's up and running, I'm going to go put another pair of gloves on and sit in Ben's room which is the warmest!